Kipposhi, a restaurant in Tokyo, Japan, has seen its popularity skyrocket recently, after photos of its bright blue ramen soup started going viral on social media platforms like Instagram. 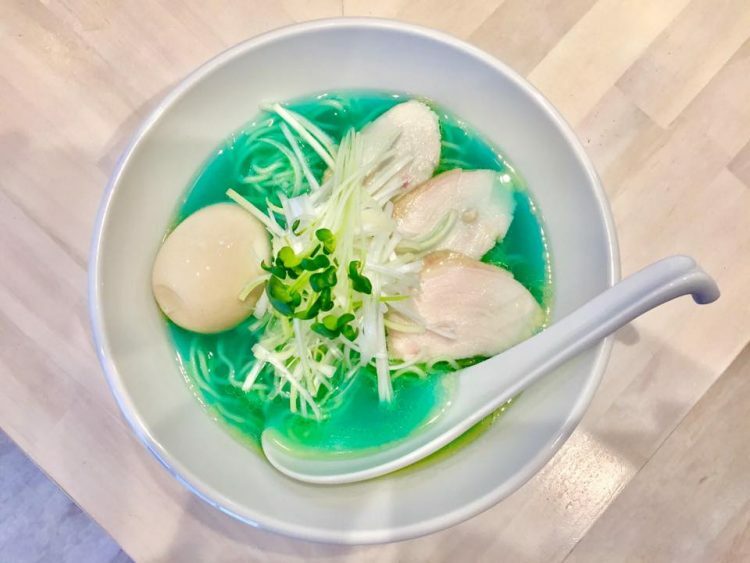 Blue soup doesn’t really sound like the most appetising dish, but that hasn’t stopped people from flocking to Kipposhi, a ramen restaurant located in the heart of Tokyo, to give its famous Clear Chicken Soup ‘Blue’ a try, or at least take a photo of it to post on social media. It all started in January of 2017, when Mr Kozuimi, the owner of Kipposhi and creator of the unique blue ramen, posted a photo of his invention on Instagram. It went viral almost instantly, becoming a social media sensation, and putting the relatively new ramen restaurant on the map of must-visit Tokyo attractions. Matcha Magazine reports that the now-famous blue soup was inspired by the beautiful Hawaiian Sea. Recreating the beauty of the clear blue ocean in a soup bowl, however, was a more daunting task than people imagine. Like most other ramen masters, Mr. Kozuimi uses a rich chicken broth for his soup, but relies on an old Chinese technique to make sure he ends up with a clear soup. Called Chintan, this technique involves boiling the broth with minced meat which absorbs the particles which would otherwise render the soup cloudy. This way, he ends up with a clear blue liquid reminiscent of the ocean water that inspired it. Everyone wants to know just how Mr. Kozuimi creates his Clear Chicken Soup ‘Blue’, allegedly without any food colorings or additives. Alas, that is a closely-guarded secret and the successful restaurant owner plans to keep it that way. However he assures everyone that his blue ramen is made with all-natural ingredients. People have been speculating that Clear Chicken Soup ‘Blue’ gets its unusual color from Pycocyanin, a natural pigment extracted from spirulina algae. It’s knows as ‘Lina Blue’ in Japan, and it’s widely used as a coloring agent in sweets, ice cream and beverages. Interestingly, SoraNews24 reports that Clear Chicken Soup ‘Blue’ is not Japan’s first blue ramen. Four years ago, ramen shop in Nipponbashi, Tokyo, also introduced a novelty item on its menu called Lina Blue Cooled Ramen. Unfortunately, Instagram wasn’t as popular back then, so it didn’t make as big an impact as the one made by Kipposhi. Bizarrely-colored foods are all the rage these days, with people going crazy over stuff like jet black ice cream or pink pineapple.